The outbreak of war marked a new era for the people of Cumbria. Many young men and women enlisted in the Forces, while older people joined the Home Guard or became Air Raid Precaution Wardens. Children from cities were sent to Kendal to escape the threat of bombing raids, members of the Women's Land Army began to arrive on at the local farms, and Silloth airfield near Carlisle trained thousands of pilots from allied countries. The first sign of German interest in the important shipbuilding town of Barrow-in- Furness was in May 1936, when a rigid airship and passenger aircraft flew very low and slowly over the Furness rooftops. Vickers shipyard became a target for enemy bombing and eventually more than 10,000 houses were damaged or destroyed by the Luftwaffe during the Barrow Blitz that took place during April and May 1941. Extensively researched, the book takes a detailed look at the ships built in Barrow, memorials in the city of Carlisle and towns and villages across Cumbria, and remembers the brave dead of Second World War. Overall, this is a poignant testimony to the momentous efforts, bravery, self-sacrifice and determination of the people of Cumbria during the Second World War, who sought to find normality in a reality so far removed from anything they had ever known. On Tuesday, 15t August, 1939, John Foster of Lawson Street, Maryport, was married to Gertrude Margarete by Pastor Behrmann in Germany. In his address, the pastor said, “Thy people shall be my people.” It was a pious wish, but one which was not to be fulfilled. The Hindenberg Zeppelin that flew low over the roofs of Barrow and Walney Island in 1936 was a foretaste of things to come. In September, 1939, Britain and Germany were at war. The next six years took their toll on Britain and on Cumbria. Young men joined the forces, women joined the Land Army, and the civilian population bent themselves to the unprecedented war effort. 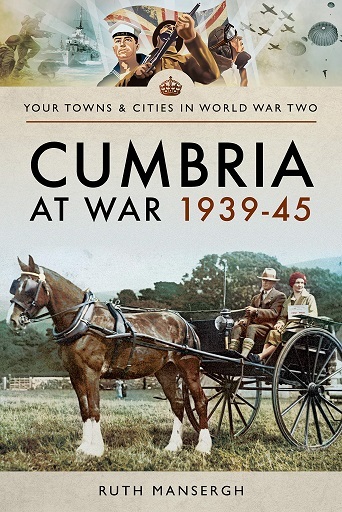 Cumberland and Westmorland may have been far removed from the theatres of war, but every town and village played its part in those tumultuous years between 1939 and eventual victory in 1945 and every family found their lives lessened by the consequences of war. In Kendal, ‘K’ shoes made 250,000 pairs, that is a total of half a million, service boots. But they also made other things. They made one hundred covers for Anson aircraft manufactured from cloth supplied by Morton Sundour of Carlisle. They made replicas of Luftwafffe flyng officers’ boots. They made kit-bags, gaiters, covers for aircraft and dinghies, and in the last months of the war, demobilization shoes. Throughout the country, men joined the Home Guard. There were two battalions in Carlisle, and one each in Longtown, Cockermouth, Workington, Whitehaven, Millom, Penrith, Keswick, Kirkby Stephen, Kendal and Warwick on Eden. The Home Front was prepared to meet whatever might happen. On 12th September, 1940, three hundred incendaries, targetted at the Vickers shipyard, were dropped on the Salthouses part of Barrow. On 17th October, a Wellington Bomber returning from a raid on the Kiel Canal ran out of fuel. The crew parachuted to safety over Penrith, and the pilotless bomber crashed on Brown Rigg Hill near Plumpton. Whitehall, “the medieval tower house” near Mealsgate became, for the six war years, the St Aubyn’s Preparatory Boarding School, which had originally been located at Woodford in Essex. The Royal College of Art moved to Ambleside. Roedean, the top girls’ School, moved to Keswick. Manufacturers moved their factories from the south-east to Cumbria. Bata Shoes which had been in Tilbury in Essex, came to Grasslot in Maryport. The Harrington Magnesite works was rapidly constructed on the site of the old ironworks. H. Edgard and Sons, civil and military tailors moved from Chelsea to Catherine Street in Whitehaven. In 1940, after being bombed in London, Marchon set up a small office, first in Hensingham, and then expanded their operations in Kells in Whitehaven. Quarrymen from Alderney in the Channel Islands were evacuated to Shap. There, at the Shap Granite Works, they made castings for the Mulberry Harbours that were to be used in the D day Landings. The manufacture of special steel ball-bearings for aircraft was moved from Norway to Chapel Bank in Workington. Sunderland Flying Planes were built and tested on Windermere. 215 Bomber Squadron operated Ansons and Wellingtons from Silloth Airfield. Prisoner of War Camps were opened in the area. Merrythought at Calthwaite held 781 prisoners, Dalston, 152, Brampton, 175 and Hethersgill 70. At Moota, where there were a thousand prisoners of war, the Germans built their own chapel. Land Girls worked on the land for 28 shillings a week. There were Lumberjills working in Grizedale Forest. The war was a tumultuous time. Everybody’s life was disrupted in one way another. Ruth Mansergh records all the many ways in which Cumbria was transformed by the years of the Second World War. Today, we are left with the memories and the memorials of that most momentous of Wars.